Full disclosure: I will be working on the new version of Viewscream, have a friendly relationship with Ken Hite, and belong to a professional organization with the makers of Chill and Cat. I also do freelance work for Lamentations of the Flame Princess. Tell your own Lovecraft-inspired story in this GMless game. Cosmic horror and terrifying elder gods can show up just about anywhere—much to the dismay of your Witness. While the stories you tell with this GMless game always take a turn for the worse, some of the free playsets are primed for horror. Back to the Old House has a creepy mansion ripe for the haunting, while Salem 1692 reenacts the Salem Witch Trials, and Camp Death brings classic slasher movie elements to your tabletop game. Are your friends more online than local? Play the doomed crew of a damaged spaceship over Skype or Google Hangouts. Into movies like Event Horizon and Pandorum? You’ll love this game. This is storytelling game about villagers uncovering the mystery in a haunted woods. It comes with pre-made scenarios and tips on making your spooky story even spookier. Instead of dice, pull out your Jenga tower to add some high-stakes tension to this macabre storytelling game. After you play through a scene, pull out a block from the tower to see if you succeed—or if your character’s fate just turned went from bad to worse. There’s a shadowy cabal of vampires in the world and you may have been unknowingly working for them. Time to go all badass spy on these leeches and get some payback. Check out the Dracula Dossier if you want to go toe-to-toe with the Impaler himself! Want flexibility in which system you use? Achtung! 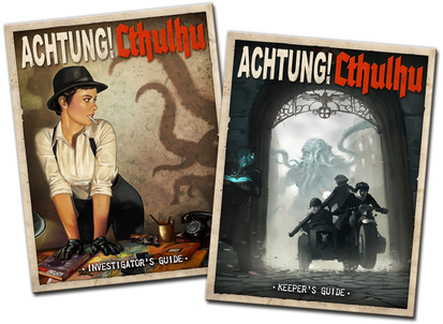 Cthulhu comes in several versions for everything from Call of Cthulhu to Fate. Play as a British commando, Hollywood starlet/spy, Russian officer, etc. and band together against the darkness of the Elder Gods. Face off against the Unknown while protecting the innocent. You’re not superheroes in this game, although you can have paranormal powers. The stakes are pretty high, but you can save the world. For those who like a old-school dungeon crawl with vampires! This Gothic horror module introduced Count Strahd von Zarovich, a vampire lord who has stocked his eerie realm with plenty of dangers. Doom awaits on a chilly mountainside, where dangers both supernatural and environmental lurk. This is a game where casting a spell could kill the entire party and, worse, may live on this mountain. Which of these games sound interesting to you? Let me know in the comments!